Get great discount on Nikon Coolpix S9300 Point & Shoot Camera | Online India shopping best deals, discount,coupons,Free offers. Preserve the most beautiful and heart-felt moments of your life in style with the new digital camera from the house of Nikon. 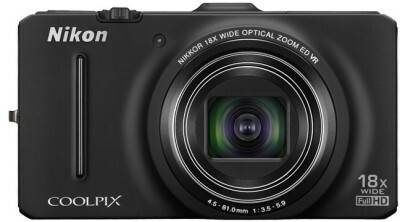 The Nikon Coolpix S9300 is from the Style series of point and shoot cameras. This stylish little camera is ideal for fashion conscious photographers who like an ideal mix of performance and good looks in their gadgets. The Nikon S9300 features a focal length of 4.5 - 81 mm and a 35 mm equivalent focal length of 25 - 450 mm. The powerful 18x optical zoom and 4x digital zoom will work tirelessly to bring the subject of your admiration exceptionally close. The Nikon Style series camera has a CMOS sensor that enables 16 megapixels of beautiful photographs. This compact camera weighs 215 g and can be conveniently transported over distances, long and short. Pop it into your pocket or in a backpack and you will be prepared to chronicle every moment of your adventures conveniently. The camera is elegantly designed, with buttons that are comfortable to use and easy to reach when you’re on a photo shooting spree. The controls on the top panel feature on a rotary dial that can easily be toggled on-the-move. Record videos to savor your favorite moments in Full HD at 1920 x 1080 dot pixels and 30 fps. The EXPEED C2 image processor boosts shooting speed to unimaginable new levels, recording images and movies with maximum image quality. The 3 inch TFT LCD screen with a resolution of 921,000 dot pixels comes in handy when you want to compose a perfect picture or want to preview the image you just took. The LCD screen also features an anti-reflection coating that reduces any unwanted glare on the screen when you’re in the sun. Battery and Storage Your images are stored in SD, SDHC or SDXC memory cards, which are easily replaceable when full. The Coolpix S9300 is powered by a rechargeable Lithium Ion battery that lets you shoot about 200 images on full charge. Be always prepared with enough battery life to take you through long events. You can transfer images from your Nikon digital camera to a computer with the high speed USB port, and always have more space to take photographs. The HDMI mini connector Type C port can be used to connect your Coolpix digital camera to a large screen LCD television, so you can watch you Full HD videos and 16 megapixel images in full size. Performance The Coolpix S9300 has an aperture range of f/3.5 - 5.9, which lets you experiment with different objects in the foreground and background of your images. The Auto focus of this point and shoot has a range of 50 cm onwards (Wide) and 1.5 m to infinity (Tele). The light sensitivity of the camera ranges between ISO 125 - 3200, letting you take clear images with low noise (grains) even in dark scenes. The shutter speed range of 1/2000 - 1 sec can also be reduced to 4 seconds in the Fireworks Show scene mode for spectacular images. Also use the built-in flash with a range of 0.5 - 5.1 m (Wide) and 1.5 - 3 m (Tele) to light up every corner of your memory for sharp images. Features This Coolpix point and shoot digital camera sports 19 scene modes that optimize settings automatically for traditional and popular scenes like Beach, Snow, Pet Portrait, 3D photography modes and more. In 3D photo mode, you can shoot images that can be played on a compatible 3D television for photographs that closely emulate real-life dimensions. The lens shift Vibration Reduction reduces blurs in images by compensating for unintentional shaking of the camera. The face priority feature automatically recognizes faces in the frame and ensures they are in focus in every image. The self-timer lets you delay shutter release by 2 or 10 secs, giving you ample time to join your friends and family in front of the lens for memorable images. In the Continuous Shooting mode, images are captured rapidly at 6.9 frames per second for electrifying effects of your subjects..The product Nikon Coolpix S9300 Point & Shoot Camera is from the famous brand Nikon. The product is currently available with the amazing discount from FlipKart.Currently a discount of 5.0% available for this product. Great discount for this product which has the original price of Rs.16950.0 and you get these amazing products for a discounted price of Rs.16100.0. Hurry up. Stock may be limited.